We all see that gaming has been evolving at a rapid pace, with new ideas and expansive experiences building off one another that baffle the mind when you take a step back to admire what gaming has become. That doesn’t mean that games we used to enjoy have been forgotten, however. The Book of Unwritten Tales 2 takes the old point-and-click adventure and makes it a glamorous, witty, and fulfilling version of what you once thought you knew of point-and-click adventures. This is a sequel, obviously, and satisfies fans who wanted to have more fun with the characters they came to love after the end of the first game. It accomplishes that goal nicely. Unless you have played the first game on PC, you won’t know the backstory from the first one, but that doesn’t stop you from enjoying this sequel. There are some narrative holes, but they are easy enough to figure out. I liked that the four main characters are off doing their own thing in the beginning after the events of the first game, but then a mysterious plague calls them to action and ends up bringing them together again to save Avantasia. Ivodora, the elf princess, sneaks out of her castle, Wilbur the gnome mage has a rocky first day of teaching mage school, and Nate the haughty human tries to pull a drunken heist, but fuzzy pink Critter has to sober him up. Those four threads twist together from there. The most enjoyable part for me was the many hilarious references to video games, pop culture, politics, and modern life in general. These are consistently slipped into the narrative and gameplay so you’re never bored. For example, you can spot a Rubik’s and Companion Cube, a Sully-like character (Monster’s Inc.), and a Minecraft sword, all in one room of the first level. Another section that really made me smile was a little bit of time travel into the past which showed the room you were in as a pixelated room (your character remarks it has become harder to move around for some reason), then further back to a 5-bit pixelated room without voice-overs (your character starts “yelling” because he can’t hear his voice anymore, and then complains he can only hear some annoying music), and finally even further back in time to a text-based adventure room. This humor polishes the game and highlights the quality. 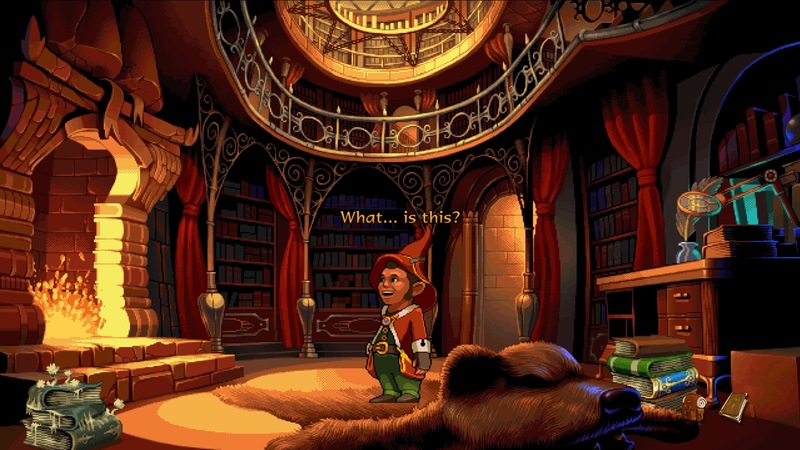 Point-and-click adventures are really obviously native to PC, and this game shows its roots on console. Walking around is slow, and clicking the various clues can be finicky. Walking through a room multiple times is part of the game, but doing so very slowly shouldn’t be. The touchpad of the DualShock 4 could have been utilized to make clue selection easier, but wasn’t. In fact, I think many of the buttons were not utilized to make the experience easier on console, but could have been. Pressing square shows all possible clues in the game, so at least that tedious hunting element is not a problem. Another gripe I had was the text being in a showy font and various colors that are not pleasingly visible or easy to read. Overall, it works, but I can see how it could have been smoother. If you are looking for a game to sit down and settle into, this is it. There are many levels, and many puzzles in each level. This is not a flash in the pan. You can sit down, work out a few knots, enjoy the tomfoolery for a while, and then come back the next day to have a good time once more. For a point-and-click, you may not expect the story to be so long and twisting, but this one is. I could never really predict what happened next. and was always pleasantly entertained. Pleasantly entertained, however, did not mean that my attention was hooked at all moments. I often got bored of standing there listening and reading through some dialogue, no matter how well the voice actors performed their lines. As my impatience dictates, I also got bored of trying to complete the difficult and multi-step puzzles, unfortunately. A more patient person who enjoys point-and-click’s specifically would not have this problem, though. The puzzles can be very challenging and, upon looking back at the solutions, very narrative specific. Puzzles that feel “realistic” or relate well to the story make this game feel superior. 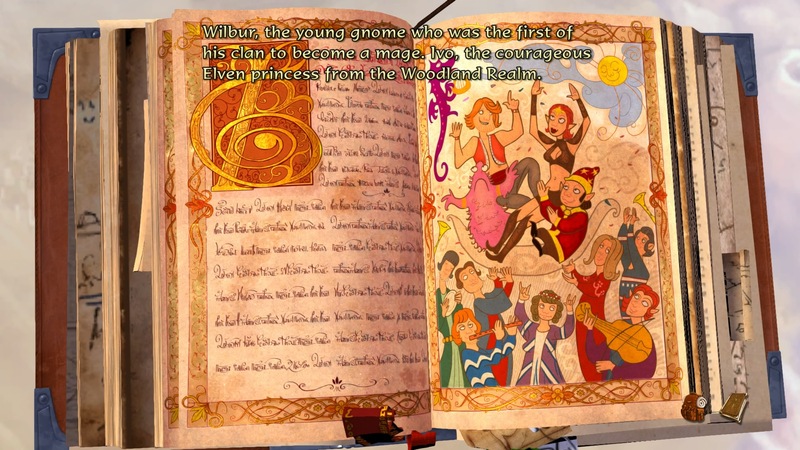 This game is also unique in that after a point in the story, you can switch between the characters to complete more complex puzzles. The entire game is colorful and richly designed, and the character animations smoothly executed. Each room has the expected stage-like setup with one backdrop and limited freedom to walk around, but is nicely portrayed in 3D while doing so. There are little details sprinkled throughout that are unique and fun to notice, which shows the caliber of the game. Combine the puzzles with top-notch graphics and plentiful entertaining dialogue, and you have something worth playing. 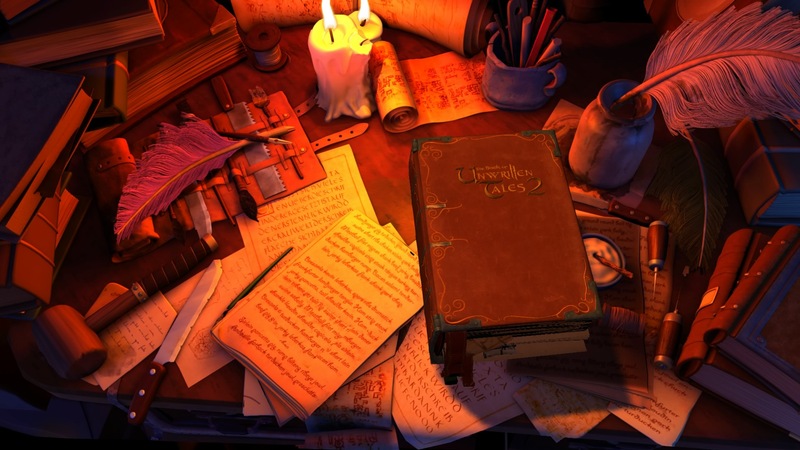 The Book of Unwritten Tales 2 is a vast and well-executed game that will satisfy many players and leave them a bit better off than they were before. The Book of Unwritten Tales 2 review copy provided by publisher. Reviewed on PS4. For information on scoring, please read our Review Policy here.